Saponaro, Inc., is a nationwide group of consulting Experts offering attorneys an objective opinion on the merits of their case. We offer an efficient, dignified approach, and are noted for our integrity and candor. Dr. James N. Saponaro, DBA, 1930 to 2003, founded Saponaro, Inc., in 1974. He is missed by all, and we honor him by following his vision for the company by maintaining the honesty, integrity, and professionalism he personified. In 1985, Guy R. Saponaro joined Saponaro, Inc., and took over the management of the business in 1995. With twenty-five plus years of service to the legal community, Guy is focused on continuing the tradition started by Dr. Saponaro, as well as expanding the business to meet all of the litigation needs of our clients. Saponaro, Inc., strives to earn your business on each case, with a professional approach and accountability for our work. Saponaro, Inc., offers a full line of services to attorneys, providing well-qualified experts and in-depth case evaluations, both in a timely and cost effective manner. We save you time to do what you know best – practice law… with the confidence that your case requirements will be met. Our fee structure is more than competitive, and we do not invoice for our Experts. Therefore, there are no hidden costs. We thoroughly screen your case with our Experts to obtain the best available match. We stand behind our service offering replacement Experts in the same specialty at no additional cost. 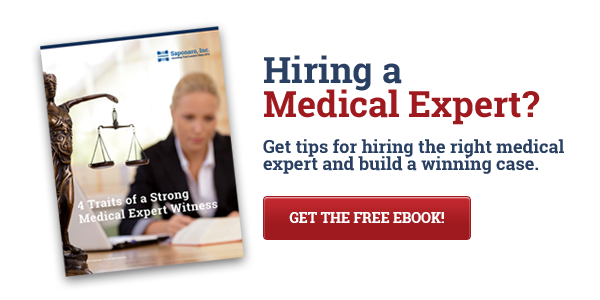 All medical reviews are completed by practicing board-certified physicians who are willing to support their opinions through deposition and/or testimony. All other reviews are done by Expert professionals in designated areas of specialty. Direct referrals are available in every specialty. We provide a no-obligation discussion of your case with a recommendation for service with our highly qualified staff.